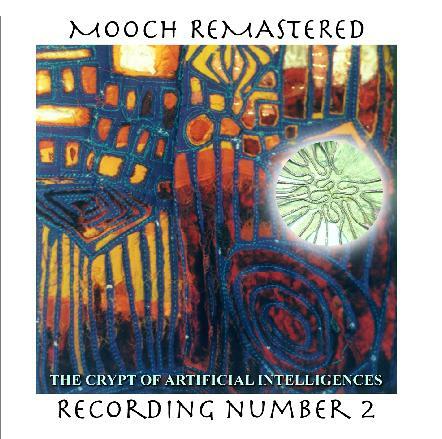 Mooch - "The Crypt of Artificial Intelligences"
Flight of the Dub Voyager (see AI #32) was the first in Steve Palmer's planned series of remastered versions of Mooch music never before released - except, in a small number of cases, as one-off private releases. The Crypt Of Artificial Intelligences is the second in the series and consists of music recorded in 1994, directly after the Postvorta album (Taste label 1994). But the last two tracks of the set, totaling about 34 minutes of music, are easily my favorites. "The Crypt (Riyadh)" is an often haunting, sometimes intense, image inducing track that is part soundtrack, part sound-art experimentation, and part space based progressive rock. It's a cinematic journey that includes some of the most challenging and adventurous music on the album. "Medina Oasis" picks up where "The Crypt" left off, using mostly guitar and effects to create a drifting and slightly jazzy ambient space excursion. The music has a kind of spaced out avant-garde soundtrack feel, occupying a dream realm, limbo or alternate dimension of lost souls. It's space ambient, yet colorful, full of character, and even playful. Credit Steve Palmer's production work stitching everything together with the artful way in which so many elements come together and skillfully avoid chaos. You can listen to this album over and over and find something new each time. A must have for Mooch fans and Palmer followers in general. Note that The Crypt of Artificial Intelligences will be available to purchase only as a digital download from Northern Star Records. You can visit their web site at: http://www.northernstarrecords.co.uk.